I know, I know, this isn't a photo of a purple cow. It's an ostrich in a racing harness. There are no purple cows and I don't have any photos of them. Oh, I suppose I could have created one with Photoshop, but that would take too much effort. 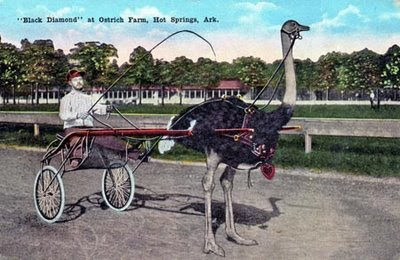 I already had the photo of the ostrich in a racing harness. I think Purple Cow is one of the first poems I ever memorized. Of course, it isn't much of a poem. But I could remember it. It was kind of like "Fuzzy Wuzzy was a bear; Fuzzy Wuzzy had no hair; Fuzzy Wuzzy wasn't very fuzzy, was he?" That always cracked me up as a kid. Ah yes, I wrote "The Purple Cow"
I kind of like that more than the original poem. Basically, I think poems should be like visits from relatives -- very brief. Oh and if you are still wondering about the ostrich in a racing harness photo...well don't. Ostridge racing really should have taken off. I mean, they are the perfect racing stock......lose to many races, and you get a pretty good hamburger, and a healthy one at that! Greyhounds....well.....they just make hyper pets you can't keep with pet bunnies. Well, the fellow 'driving' the ostrich is interesting :-) As you can tell, I usually prefer brevity in poems ... the pages long narrative ones usually lose me early on, even if their poetic prose is flawless. THE Michael, taking the minority position on a topic as usual. Whitesnake, I knew you wouldn't. Commenting on a comment...oh well. Okay, not much of rhyme scheme, but still.